Leonberg Nursery is located at: 810 North Lenola Road, Moorestown, NJ. Proceed West on Main Street towards Maple Shade. Bear right onto fork for Camden Avenue. Follow 1/2 mile to McDonald’s and turn right onto Lenola Road. We are 1/2 mile down on your left-hand side. 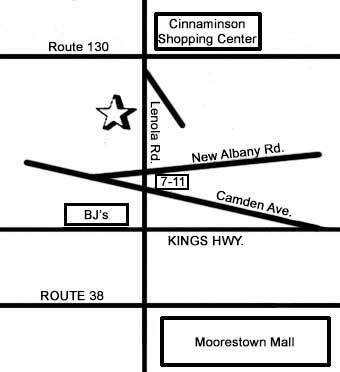 Turn North onto Lenola Road (going away from Moorestown Mall) and follow for 1.7 miles. You will pass BJ’s, McDonald’s and the Lenola Firehouse. We are located on the left-hand side just past Maranatha Church. Turn East onto Church Road towards Moorestown. Follow a short distance past Wawa to traffic light. Turn right onto Lenola Road and follow for 1.7 miles. We are on the right-hand side. Exit onto Route 73 North. Go 2.2 miles to exit for RT 537 / Moorestown. Come up Exit ramp and turn right onto Camden Avenue. Go to 2nd traffic light (McDonald’s on corner) and TURN left onto North Lenola Road. We are 1/2 mile on the left-hand side just past Maranatha Church.